Andrew McCarthy, the U.S. prosecutor who successfully put away Omar Abdel Rahman, the blind sheikh, has finally written the piece that many of us have long intended to do but never got around to doing – exposing the work of Laurie Mylroie. I met Mylroie in 1984 and we hit it off. We especially agreed on the need to bolster Iraq at a time of Iranian offensives against that country, even writing a joint article in The New Republic in 1987 on this subject, "Back Iraq: It's Time for a US Tilt." As late as 1991, I favorably reviewed her jointly-authored book with Judith Miller, Saddam Hussein and the Crisis in the Gulf. In what amounts to the discovery of a unified field theory of terrorism, Mylroie believes that Saddam was not only behind the '93 Trade Center attack, but also every anti-American terrorist incident of the past decade, from the bombings of U.S. embassies in Kenya and Tanzania to the leveling of the federal building in Oklahoma City to September 11 itself. She is, in short, a crackpot. Of all these episodes, however, the 1993 World Trade Center bombing became her bête noire, her abiding obsession, the subject of a highly imaginative book, and her direct point of contact with McCarthy. 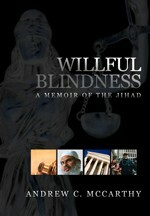 As I say, we who were involved in the fight against radical Islam found her theories nonsensical, distracting, and in some cases actually harmful (as in her giving evidence in the 1999 Hany Kiareldeen case in New Jersey, helping an accused Palestinian terrorist to be wrongfully released from jail; for details, see "Decision of the Board of Immigration Appeals, File A77 025 332 – Newark, October 15, 1999, In re: Hany Mahmoud Kiareldeen," written by Gerald S. Hurwitz on behalf of the Board of Immigration Appeals). But who had the time to explain all this? That is where Andrew McCarthy's 3,100-word article today, "Still Willfully Blind After All These Years," is so useful. McCarthy begins by summarizing Mylroie's WTC argument: "She was spouting a theory that the attack had been the work of Saddam Hussein and that we ignoramuses were completely missing the boat by charging Islamic terrorists, notwithstanding the overwhelming evidence that they had carried out the atrocity." McCarthy goes on to call Mylroie's briefing for him "shoddy" and her theory " loopy." He describes her as "a thorn in the side … the analyst whose zany assertions are routinely used to discredit credible evidence of cooperation." His analysis then shreds her argument, leaving nothing to the imagination. Mylroie comes up In several of the books written about the Iraq War as a terrorism analyst who led the Bush Administration into making questionable claims about Iraq and al Qaeda. (George Packer, the New Yorker writer and author of the otherwise well-reported book, "The Assassin's Gate," makes this mistake.) This vastly overstates her role. Although her emails may have occasionally made their way to Bush administration officials, no one I know took her arguments very seriously. For good reason. Mylroie has seen an Iraqi hand behind virtually every terrorist attack on American interests. Indeed, in our one brief conversation, she faulted me for failing to understand that al Qaeda is little more than an Iraqi "front group."